Blue Cross Blue Shield of Illinois canceled plan members have new low priced option in Cook county including access to top teaching hospitals. 2016 ACA Open Enrollment is going on right now and the biggest health insurance story since the last time Blue Cross Blue Shield of Illinois canceled 185,000 individual health insurance policies in 2013 is their current decision to cancel 173,000 individual health insurance policies this year. What’s even worse is that this year, there has been no intervention from the White House (as there was in 2013) that allows at least some of these policy holders to keep their existing plans. Even worse is the fact that even though these former policy holders are willing to pay significantly more to keep access to the top teaching hospitals in Chicago like Northwestern Memorial, University of Chicago hospital, Rush University Medical Center and the Ann & Robert Lurie Children’s Memorial hospital, they are unable to do so. Instead, they are being auto enrolled into new plans that do not include access to any of the aforementioned teaching hospitals. In an earlier article, I presented guidance for those living outside of Cook county to retain access to these hospitals. There is now a new and much lower priced option for those living inside Cook county. That option is a new health insurance start up called Harken Health, an independently operated subsidiary of United Health Group, America’s largest health insurer. Harken Health entered the Illinois health insurance marketplace on November 1st and we are just now getting a look at their prices. They are much more affordable than the options available to those living outside of Cook county who wish to retain access to the top teaching hospitals in Chicago. 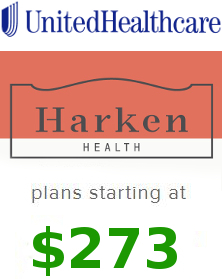 What is unique about Harken Health is their networks, their prices and the unique ability to visit one of their “Harken Health Centers” and pay nothing. Harken Health’s networks include their ‘Preferred’ network which includes the aforementioned top teaching hospitals and their ‘General’ network which together include approximately 850,000 physicians and care professionals and 6,100 hospitals and other care facilities nationwide. The best part about the presence of Harken Health is that Cook county residents no longer need to rely upon Land of Lincoln Health, one of the 23 troubled health care ‘co-ops’ which ended 2014 with a $17.7 million loss and in the first 6 months of 2015 had claims that outpaced premiums by $26 million and ended 2015 with a total operating loss of $90.8 million. There is now a far better option from a carrier that has the backing of the largest health insurer in the U.S. with tremendous financial reserves and a broad, inclusive nationwide PPO network. 1.) When you begin your quote it will look as though you can only get quotes from United Healthcare. However, once the four recommended plans load just click on “ACA Medical” just above those plans and all of the ACA qualified plan options will load. 3.) Simply find a plan you like and click on ‘Doctor Network: Harken Health Network‘ just to the left of the price of that plan. 4.) That will then load the easy to use Harken Health network search page. From their you can search for your preferred doctors, hospitals and other network providers. 5.) To find the outline of coverage for each plan simply click on “SBC” under each plan name and an Adobe PDF document will open and you can view and download the plan brochure.